Mapping users' expectations regarding extended-range forecasts Mapping users' expectations Tiina Ervasti et al. An online survey was used to map the needs and preferences of the Finnish general public concerning extended-range forecasts and their presentation. First analyses of the survey were used to guide the co-design process of novel extended-range forecasts to be developed and tested during the project. In addition, the survey was used to engage the respondents from the general public to participate in a one year piloting phase that started in June 2017. The respondents considered that the tailored extended-range forecasts would be beneficial in planning activities, preparing for the weather risks and scheduling the everyday life. The respondents also perceived the information about the impacts of weather conditions more important than advice on how to prepare for the impacts. Ervasti, T., Gregow, H., Vajda, A., Laurila, T. K., and Mäkelä, A.: Mapping users' expectations regarding extended-range forecasts, Adv. Sci. Res., 15, 99-106, https://doi.org/10.5194/asr-15-99-2018, 2018. Figure 1The survey structure consisted of five thematic sections: usability (yellow), visualization and delivery (red), content (green), respondent's background (blue), contact information (black). Depending on the previous answers, not all questions had to be answered. As part of developing the climate services, much focus has been put on the extended-range forecasts (ERF; up to 46 days) and long-range or seasonal forecasts (LRF; 1–7 months). For instance, in the FP7 project CORE-CLIMAX (Gregow et al., 2016b; Su et al., 2017) it was found, based on a worldwide survey, that in addition to homogenized climate data records monthly and seasonal forecasting are considered important in the development of future climate services. Additionally, the impact assessments for improving weather warnings and their criteria were considered desirable. Also, based on the findings of project ELASTINEN (Gregow et al., 2016a; Harjanne et al., 2017; Pilli-Sihvola et al., 2016), one of the recommendations given to the Finnish Government was that impact-based forecasts and warnings are relevant for decision-making related to climate change adaptation. The use of ERF and LRF in decision-making processes is still relatively new in Europe and fairly underutilized or not used at all in many sectors (Bruno Soares and Dessai, 2016; Soares et al., 2017). One reason for this is the low reliability and skill of the forecasts in Europe. Also there is a lack of awareness that such forecasts are available and sometimes the content of information provided by the forecasts is ineffective (Bruno Soares and Dessai, 2016). Although there are many challenges remaining, the progress in developing the ERF and LRF forecasts is fast. This improves the opportunities of developing user-oriented climate services (Vitart et al., 2017). Finnish Meteorological Institute (FMI) has been using the long-range forecasts of ECMWF (the European Centre for Medium-Range Weather Forecasts) for years. However, the use has been mostly non-operational and the outlooks for the general public have been provided in text format on the FMI website, therefore not engaging the public much in the development of the services. Furthermore, only a few case-study verifications have been made (Hyvärinen et al., 2017) for showing the capability and usefulness of these forecasts for the Finnish society. Buontempo et al. (2014) especially emphasize the need to maintain the dialogue between providers and users of climate information when developing the climate services. In CLIPS-project (CLImate services supporting Public activities and Safety, 2016–2018) user engagement is in the heart of developing extended-range forecast services and piloting them with users from the general public. The survey presented in this paper was launched at the planning stages of the ERF services and it was the first step in the co-design process of the project. The aim was to map the users' needs and preferences in detail and use the responses from the survey to guide the design process of the first forecast prototypes. In the second step of the co-design process pilot users test seasonally tailored extended-range forecasts for Finland. 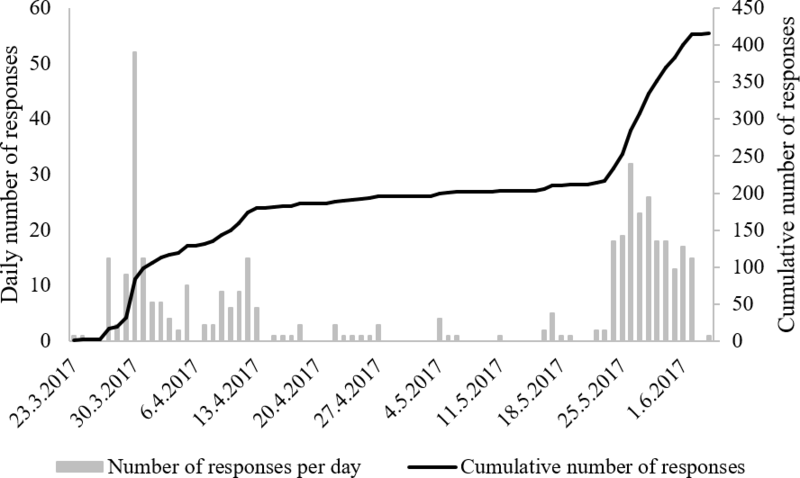 In this piloting phase of the CLIPS-project (June 2017–May 2018) the outcome of the CLIPS online survey can also be further verified and expanded on. Also, a website was designed to provide information and news, for instance about lessons learned, to improve the dialogue. In this paper, we present some outcomes of this survey and our first attempts to co-design extended-range forecast services within the CLIPS-project. We will specifically focus on how users estimated they could benefit from the ERF products and services, and whether they appreciate the aspect that the impact information is built-in in the ERF service. Based on the analyses and discussions presented in this paper, we hope to be able to provide new insights of the user perspective for future development of weather and climate services. The CLIPS online survey was targeted at the Finnish general public. It was structured in five sections and consisted of maximum 21 questions (Fig. 1). The sections included questions about usability and preferences for certain tailored ERF products, visualization and delivery of the ERF products, content of the ERF products, background information of the respondents, and willingness to pilot the novel ERF services. In the beginning of the survey a set of 28 ERF products was presented for the summer, autumn, winter and spring seasons to give the respondents an idea of the possible products (see Appendix A). Product portfolio contained descriptive names of the possible products, but no visualized examples or detailed information of the content. In this paper we focus on the aspect of how users think they could benefit from ERF products. The survey questions that contribute to this aspect and are analyzed in more detail are listed in Table 1 (questions 2, 10 and 11). Question 2 had seven ready-made options (see Table 4) and an open field to provide the respondents the choice of giving their own answer. Respondents were able to choose as many potential benefits as they wished. Respondents could also elaborate whether they would benefit of the forecasts in their work, free time or in both occasions. Questions 10 and 11 were based on rating-scale: I consider it very important, I consider it somewhat important, I consider it not that important, I don't need this kind of information. Table 1Questions from the survey about how users estimate to benefit of the extended-range forecast products. The CLIPS online survey was distributed to the Finnish public with two-folded approach to reach as many respondents as possible. The two-folded distribution approach included (1) general communication channels, such as website and social media channels of FMI and the CLIPS project's own website (http://clips.fmi.fi, 24 April 2018) and (2) more than 100 national and regional organizations, institutions, and associations, whose members could potentially benefit from ERF products. Therefore, the targeted users also covered economic and social sectors such as health, education, tourism, transportation, forestry, agriculture, rescue services, civil engineering departments of major cities, and various sport or outdoor organizations. The survey was opened to public for 10 weeks during 23 March–5 June 2017. The promoting of the project was combined with distributing the survey. Following steps were involved: (i) emailing about the survey and the following pilot phase with targeted invitation letters that were sent during 23–30 March 2017, (ii) promoting the CLIPS online survey in the social media channels of FMI, including FMI Beta (Facebook page) and FMI's Twitter channel focused on research and science topics (which has currently 6521 followers), (iii) launching the CLIPS project website http://clips.fmi.fi on 9 May 2017, (iv) releasing a press release about CLIPS and the ongoing survey on FMI main website on 16 May and sharing it in the FMI social media channels, (v) placing CLIPS-project teaser on the website of the FMI long-range forecasts with a title “Forecasts for 6 weeks?”. The results of these communication and dissemination efforts are presented in Fig. 2, where especially steps (i), (ii), and (iv) show as visible leaps in the number of responses. 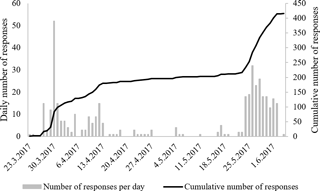 Figure 2The rate of responses received on CLIPS online survey during the 10 weeks open period. The CLIPS online survey was aimed at guiding the development of extended-range forecast prototypes for the pilot phase of the project. Based on the survey results, the ERF prototypes were then improved and made more user-friendly based on the opinions of the general public. When the survey was launched, the prototypes were still in the development phase and not available to the respondents. However, some basic guidelines were already set and we describe them here to give an idea of the planned ERF products. The prototypes were based on the 0–46 day ERF data from the ECMWF (all 50 ensemble members). Additionally, the hours 00:00, 06:00, 12:00, 18:00 UTC were available when tailoring the forecasts. The forecasts were presented as weekly means and extremes for those hours that played an important role for the activities it was tailored for. Here we describe two examples of the extended-range impact forecast prototypes in the planning phase: thunderstorm and sport weather outlooks (Fig. 3). The thunderstorm outlook was designed to demonstrate the risk for thunder and lightning using a five-point severity scaling. On a map of the Nordic countries we showed if the forecast indicated a risk for weak, moderate, severe, very severe or extremely severe thunderstorm and lightning in the coming weeks. The outlook was a combination of weekly mean CAPE (Convective Available Potential Energy) anomaly and historical lightning data of the Finnish Meteorological Institute. First, a weekly statistical lightning map was produced and then, the map was modified based on CAPE anomaly forecast. The sports weather outlook was communicated differently. It presented the impact of weather conditions on the possibilities to perform outdoor sports using four categories: Poor (Pink), Moderate (Orange), Good (Blue) and Excellent (Green). Sports weather index included wind speed (WS), temperature (T) and relative humidity (RH) between 09:00 am–09:00 pm local time. Figure 3Two examples of extended-range impact forecast prototypes. Thunderstorm outlook (a) and sport weather outlook (b). The CLIPS online survey resulted in 416 responses in total. However, eight respondents considered not to be interested in the planned extended-range forecasts and no further questions were asked from them. Therefore, the sample of 408 replies is used as the data set. As some respondents left some questions blank or unanswered the amount of replies varies between the questions as addressed in Table 1. The sample covered wide range of the general public. 63 % of the respondents were male and 36 % female, the rest did not want to express their gender. The most represented age groups were 50–59 (26 %), 40–49 (24 %), 30–39 (20 %), 60–69 (18 %), in that order, but the sample involved all age groups. In addition, the sample covered all regions of Finland except Åland region, even though the Uusimaa region (capital area) was slightly overrepresented in the sample with 30 % share. The respondents also came from various different residential environments as 29 % lived in large cities (over 100 000 inhabitants) or in their suburbs (9 %), 24 % in small or medium-sized cities (20 000–100 000 inhabitants), 17 % in smaller population centers and 21 % in the rural areas that are sparsely populated. Over 90 % of the respondents stated that they use some kind of weather forecasts, 80 % some kind of monthly forecast product and 50 % some kind of seasonal forecast product. Only 8 % replied that they had not used these types of forecasts. When asked which of the currently provided long-range forecast services the respondents knew and were using already, the three most mentioned were the FMI monthly forecasts, the FMI seasonal forecasts and other providers’ monthly forecasts (Table 2). 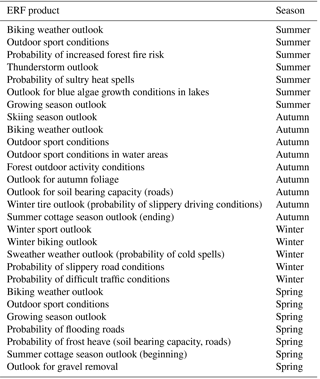 Table 2The provider and the type of long-range forecast that the respondents (N=408) were familiar with. In the survey a set of 28 possible products was presented for summer, autumn, winter and spring (question 1 in Fig. 1, full list in Appendix A). The most popular were the sweater weather outlook (cold spells), winter tire outlook, thunderstorm outlook, probability of difficult traffic conditions, and growing season outlook (Table 3). This information and feedback related to possible benefits of these product examples were considered when further working on the pilot product prototypes for each season. Table 3The ten most popular products presented in the survey's product portfolio ordered by popularity. Most of the respondents were already familiar with some kind of monthly and seasonal forecasts (Table 2) and showed interest in the possible ERF products presented in the survey (Table 3). Respondents were then asked to estimate how they would benefit from the novel tailored extended-range forecasts (question 2, Table 1). The three most popular options were: help in planning activities, help in preparing for weather risks and making everyday life easier (Table 4). In addition, two benefits were commonly described under the option “other”: help in scheduling activities and generally following the coming weather conditions. Table 4Potential benefits considered by the respondents (N=406) if using the tailored extended range forecast products presented in the survey's product portfolio. The percentages indicate the share of respondents that chose the benefit. The order of most commonly chosen benefits was very similar between aspects of work and free time. Economical benefit was the only one that was more often related to work than to free time use. In general, 56 % of the respondents chose at least one work-related benefit gained from using extended-range forecasts. In contrast to this, over 90 % chose at least one potential benefit linked with their free time. Thus, respondents more commonly estimated to benefit from extended-range forecasts on their free time rather than at work. The respondents, who stated they would benefit from ERF products in their work, worked mainly in private organizations (53 %) but also in municipalities (17 %), other governmental organizations (19 %), or non-governmental organizations (6 %). They represented over 27 different fields of work, the most common being agriculture and food production, education, and traffic and infrastructure. 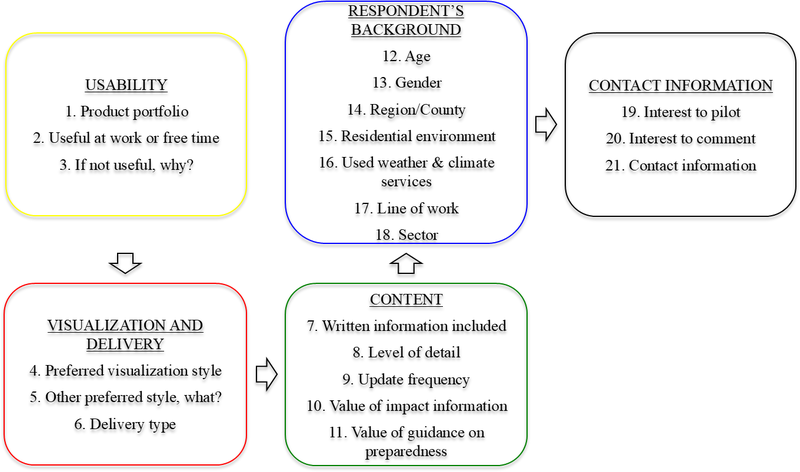 All respondents were also asked to rate, how important it is for them that impact and/or preparedness-related information is coupled with the extended-range forecast (questions 10 and 11, Table 1). As seen in Fig. 4 the responses indicated that almost 40 % of the respondents thought that it is very important to get information on the possible impacts of weather conditions. Approximately as many considered that it is at least somewhat important. On the other hand, only about 20 % of the respondents considered it very important to include guidance on how to prepare for the impacts, and 30 % of the respondents considered it somewhat important. Figure 4Rated value of built-in impact information compared to preparedness-related information in extended-range forecasts. The CLIPS online survey was designed to support the product development process and to be exploratory and open in nature. Therefore the outcome can not be generalized to represent the opinions of the whole Finnish general public. However, it provides a new insight in the needs of the general public, as extended-range and long-range forecast products are often targeted at certain professional sectors. Therefore most available information comes from the surveys or co-design processes with targeted professional sectors and not general audiences. In the survey over 80 % of the respondents stated they used some kind of monthly forecast product and over 50 % some kind of seasonal forecast product. As monthly and seasonal forecast products are often considered to be less used by the general public, it can be assumed that a lot of respondents took the survey as they were interested in the topic of extended-range forecasts to begin with. Also, respondents estimated more commonly to benefit from tailored extended-range forecasts on their free time rather than at work. This suggests that also users outside usually targeted professional sectors think they could benefit from extended-range forecasts. The respondents from the general public also rated the impact information higher than guidance on how to prepare for these impacts. The aim of the survey was to map the users' perspective in more detail and use the outcome to guide the design process of the first forecast prototypes. Based on the survey, we were able to choose the most interesting tailored ERF products to be tested and to improve our already-planned ERF products (Fig. 3). The feedback related to possible benefits linked with the product examples were considered when further working on the prototypes for each season. We also managed to engage the first 200 pilot users to test the ERF prototypes through the survey. The outcome of the survey also supports us in assessing the experiences of users before and after the piloting phase of the project. In the future, more information on the users will be gathered in the piloting phase of the CLIPS project, in which pilot users will test various tailored extended-range forecasts in practice and give feedback. Combining the results of the CLIPS online survey and the feedback from piloting provides a larger data set, in which the user needs of ERF products can be more closely mapped. For instance, one option would be to consider whether different demographic variables had an effect on how the respondents perceived the potential benefits of extended-range forecasts or the value of impact and preparedness-related information. These demographic variables cover for example the residential environment (large city, suburb, rural area etc.) as people generally use distinct means of transportation when commuting from different kinds of residential environments. Outcomes could indicate that some groups of the general public might benefit even more explicitly of climate services of this kind or they might have special needs regarding the forecasts. From the previous projects CORE-CLIMAX (Gregow et al., 2016b; Su et al., 2017) and ELASTINEN (Gregow et al., 2016a; Harjanne et al., 2017; Pilli-Sihvola et al., 2016), we had learned that the ERF and LRF services as well as impact forecast are desired part of the climate services. Thus, with the CLIPS online survey, we wanted to better understand the details for tailoring these kinds of services for the public. According to the views of the 408 respondents the potential benefits of the ERF services are: (1) better understanding of the possible weather related risks and (2) aid in preparing for weather conditions and their likely impacts. Additionally, respondents of the CLIPS online survey most commonly chose that they would benefit from ERF products when planning their free time activities although work-related benefits were also considered possible. Based on these findings, the piloting phase of the CLIPS project started with focus on tailoring ERF products and services that would indicate the risks and the possibilities with built-in information about the impacts of weather. The results of the CLIPS online survey are being further developed and verified during the piloting phase of the CLIPS-project (June 2017–May 2018), when registered users test seasonally tailored extended-range forecasts. Thus, in the future, it is possible to study the perceptions and needs with respondents who are piloting the novel extended-range forecast services in practice. The survey data is available only in Finnish and is at the moment not publicly archived as the project is still ongoing. However the survey was partially translated, as applicable, and those parts were included to support the analysis and conclusions presented in this paper. Table A1Product portfolio of the possible tailored extended-range forecasts presented in the CLIPS online survey. TE and HG planned the paper together. All authors took part in the survey construction, survey analyses and/or writing. This work was supported by the Academy of Finland, project number 303951 (SA CLIPS). We thank ECMWF collaborators Erik Andersson, Laura Ferranti, David Richardson, Tim Hewson and Ivan Tsonevsky for their valuable support in the project. Authors want to thank Juha A. Karhu, Otto Hyvärinen, Hannele Kaija and the Customer Services department of FMI for their useful comments in the planning phase and the volunteers who acted as the test general public before launching the survey. Also, Hadassa Hovestadt is acknowledged for helping in the analysis of survey results. Big thanks to all those Finns, who replied to the survey and gave their valuable opinion for us to work with.